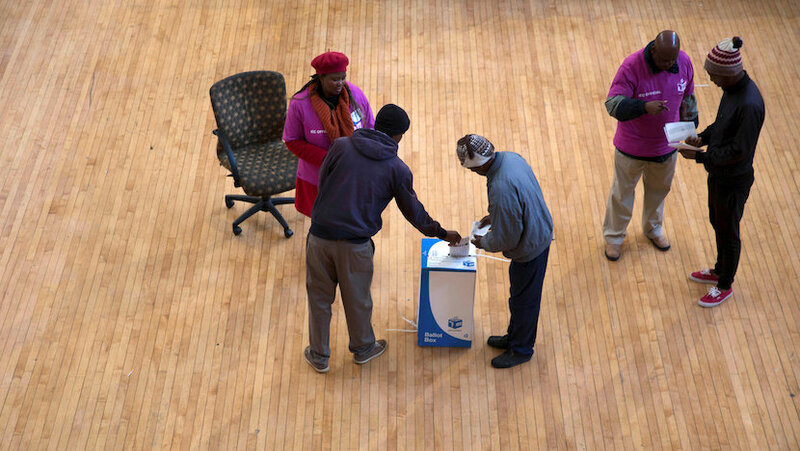 South Africa's most important election since the dawn of democracy in 1994 is being closely watched around the world. Here is our updated summary of votes cast in the six major metropoles - and for the country as a while. PRETORIA, Aug 4 (Reuters) – Urban South Africans dealt the ANC its biggest political blow since the end of apartheid on Thursday, knocking the ruling party off its perch in three cities as voters vented anger at corruption, high unemployment and poor public services. The African National Congress (ANC) – which ended white-minority rule when it won power in the first democratic national election in 1994 – still held a big lead in the overall count in nationwide municipal elections. But it was trailing the opposition Democratic Alliance (DA) in Port Elizabeth, which it has previously held virtually unopposed for the last two decades. The ANC was also unlikely to make it to a 50 percent outright majority in the capital Pretoria and economic-hub Johannesburg. A significant loss of support for the ruling party in these areas could mark a watershed in South African society and politics as the country shifts from what has effectively been a one-party system in the era immediately post-apartheid. It could reshape the political landscape ahead of the 2019 national election, and may also embolden President Jacob Zuma’s rivals within the ANC to challenge him. The municipal vote comes as Africa‘s most industrialised country teeters on the edge of a recession after a string of corruption scandals surrounding Zuma. The ANC failed to win Zuma’s hometown of Nkandla in Kwa-Zulu Natal province, a personal blow to Zuma, where the Inkatha Freedom Party retained its hold on the region. Many ANC supporters are switching allegiances to the DA, bolstering its attempts to attract black voters and shake off its image of a party that chiefly serves the interests of the minority white community. With 85 percent of the vote counted, the ANC led in the national count with 53.5 percent at 1830 GMT, against 27.5 percent for the DA and 7.5 percent for the left-wing Economic Freedom Fighters. Final results are expected by Friday. The DA, which last year elected its first black leader, Mmusi Maimane, was ahead in Johannesburg and in Nelson Mandela Bay, the area named after the anti-apartheid hero who led the ANC to power. It includes the city of Port Elizabeth. The DA had an unassailable lead, almost 69 percent of the vote, in Cape Town, the only big city currently not run by the ANC. 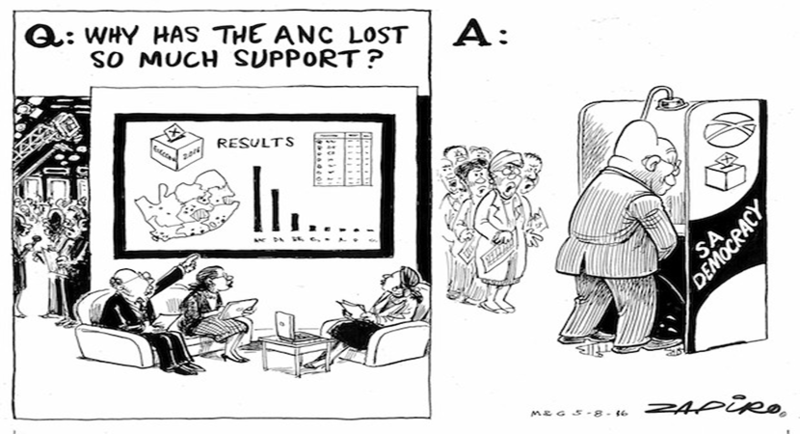 Is it too early to speculate about how ANC may react to JZ as a result of polls? Little doubt he has cost them. Will he serve his full term? The ANC was dominating most of the countryside, long a key area of its support, underscoring a widening political divide between urban and rural South Africa. “The ANC vote has held up well in rural areas but fallen away sharpest in urban areas, as expected. The ANC is therefore becoming a party of the rural vote,” Nomura analyst Peter Attard Montalto. The ANC had 42.9 percent of the votes in Tshwane municipality against the DA’s 42.7 percent after half the votes were tallied. In Johannesburg, the opposition party’s lead had been trimmed to 42.09 percent to 42.02 percent for the ANC, with 47 percent of the votes counted. In Nelson Mandela Bay it led with 49.5 percent versus 39.2 percent, with 94 percent of votes in. ANC officials in Nelson Mandela Bay cried foul and said it was lodging a complaint about 500 dumped ballot papers found there with votes marked for the party. Opponents say defeat in a region named after the ANC’s liberation hero would be an embarrassment for the ruling party. The Economic Freedom Fighters (EFF), which is led by Julius Malema, Zuma’s one-time protege and a former ANC youth leader, is participating in only its second election and was running a distant third in the votes counted. It is, however, winning some support from voters frustrated about inequality in country where blacks make up about 80 percent of the population of 54 million, but ownership of land and companies remains mostly in the hands of whites, who account for about 8 percent of the population. The rand currency and government bonds firmed on Thursday, boosted by the smooth running of the elections. Many South Africans who queued up to vote across the country said they were worried about Zuma’s performance and the state of the economy. Zuma survived an impeachment vote in April after the Constitutional Court said he breached the law by ignoring an order to repay some of the $16 million in state funds spent on renovating his private home in Nkandla. In December, he rattled investors after changing his finance minister twice in a week, sending the rand plummeting. Zuma has said he would repay some of the funds spent on his home. Pretoria – Political horse trading has started on the floor of the national IEC results centre, as provisional vote tallies gradually trickle in and reality dawns after months of election campaigning. By 16:00 on Thursday, 75% of the votes had been counted and audited, with results from the metros the slowest to come in. 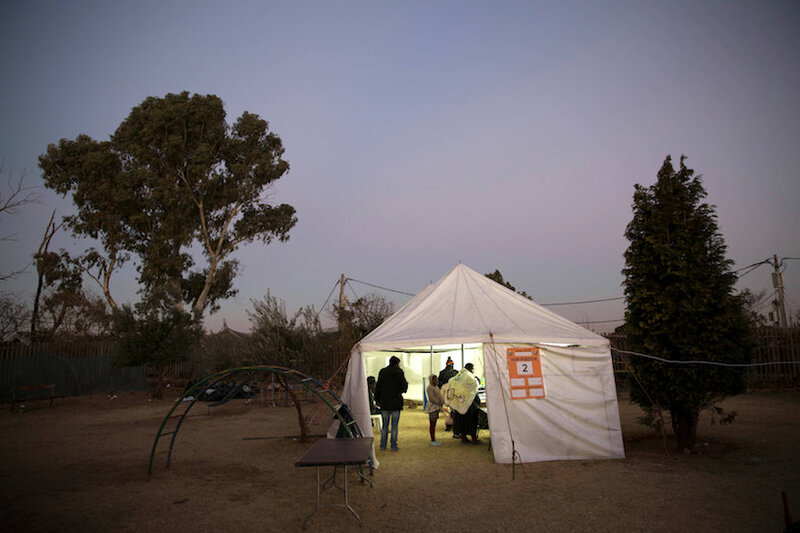 The buzz on the floor grew toward the afternoon, with most activity around the Democratic Alliance’s table – the party that looks set to score the most from these elections after an almost year-long campaign. A large team of party election hacks – most of them old hands, like DA chairperson Mike Moriarty and federal council chairperson James Selfe – in branded blue T-shirts stood around the table watching and analysing results, while a smiling spokesperson, Phumzile van Damme, spoke to journalists. Although DA leader Mmusi Maimane declared that it was too early to talk about coalitions, a source in the Economic Freedom Fighters said they have asked the DA for a meeting next week to discuss possible co-operation. All Maimane would say was: “We will never go into a coalition that will undermine our ability to deliver to the people of South Africa. The EFF would, apparently, agree to team up with the DA to have them governing in Tshwane and Nelson Mandela Bay, while the red brigade would want to govern in Johannesburg or Ekurhuleni in return. This might not find favour with the DA because, even though News24’s projections show that the African National Congress and DA could both get 42% in the metro and the EFF 10% – which would make the EFF the kingmaker – the party’s showing in the Nelson Mandela Bay Metro isn’t significant enough to give it bargaining power there. Despite ANC sources claiming that the party would win up to 37 out of that metro’s 60 wards, News24’s projections for Nelson Mandela Bay show that the DA could get just above 47%, with the ANC set to get in the low 40s. The United Democratic Movement is most likely to be in a kingmaker position here. Even though provisional results – with counting ongoing – in Johannesburg put the DA at 42.5% and the ANC at 41.3%, News24’s projections were that the DA could emerge with 44.5% of the vote and the ANC with 38.5%, making the EFF – with its 10% of the vote – a possible kingmaker here too. Meanwhile, talk on the floor was that the Freedom Front Plus, which ran its campaign on the ticket of get rid of an ANC government, had indicated that it would talk to the ANC – and not the DA – about coalitions in Tshwane, where it was the third biggest party in the council before the elections, with 1.7% of the 2011 vote. At the ANC table, party treasurer-general Zweli Mkhize remained poker faced as he focussed on the results board. The governing party’s results usually only pick up when vote tallies in the larger voting districts come in – which is expected overnight or in the early hours of tomorrow morning – and Mkhize knows that. Still, it is an agonising wait. An ANC-aligned government official, however, said in a private conversation that the party was expecting an underwhelming result. Already in the 2014 general elections, its support in the Gauteng metros showed a drop. “We have been asking ourselves the difficult questions for two years already,” he said. ANC deputy secretary general Jessie Duarte, however, looked on edge and did not even muster a smile to greet journalists. A party official at a nearby table even claimed that Duarte had given them – and a spokesperson from another party – the middle finger. EFF secretary general Godrich Gardee had not slept all night and by 12:00 the stress was showing. Even though his party had mustered almost 8% of the national vote, it had barely shown any growth since the 2014 elections. Asked to comment about his party having won two wards – one in Rustenburg around Marikana and the other one in KwaZulu-Natal’s Nongoma Municipality, according to a tweet by @sentletse – Gardee indicated that he would rather finish his phone conversation. For the EFF it was control of a council that mattered, not wards, he said. EFF deputy leader Floyd Shivambu and chairperson Dali Mpofu walked into the results centre after lunch time, but initially refused to speak to the journalists that accosted them, because of other urgent business. The Inkatha Freedom Party table was all smiles, however, as its support edged past 5% nationally, with a significant portion of the KwaZulu-Natal vote still to come in. “We have made up what we lost in 2014,” IFP MP Liesl van der Merwe said.